The Adult Forum will meet at 9:15 AM in the parish hall to conclude our Lenten program: It’s Time to: STOP, PRAY, WORK, PLAY & LOVE. This week’s focus is LOVE. Children’s Chapel, in the day school library, begins following the reading of the Gospel during the 10:30 AM service. The Episcopal Youth Community will meet at noon in the parish hall. You came on Ash Wednesday and left before I could speak to you. dark trails of mascara trace down your cheeks. to your young and sorrow-filled face. as you were to Lent’s sorrow. to wipe away every tear. Communion at the monastery consists of sweet brown bread in round loaves, broken into thick pieces for distribution; and golden wine. From out of nowhere, I start to wonder about the math of it all. I’ve been receiving communion since the age of 4, roughly once per week for the last 49 years, the bread mostly as wafers. If each sip of wine is a teaspoon and each wafer is a quarter of a gram (I looked it up! ), then thus far in my lifetime I’ve drunk about three gallons of communion wine and eaten 1 and 1/3 pounds of communion bread. Three gallons of Jesus’ blood and 1 1/3 pounds of Jesus’ body. but then must be retrieved. You watch my bag; I guard yours. Our crosswords keep us busy. and dash to be first at the counter. It does not occur to me to offer you any help. and you see my alarm. You point to your husband, our seats, my undisturbed bag. reassurance and compassion beyond what I deserve. and I see a glimpse of God. Before it was mine, the clock was Mom’s. Before that it belonged to Auntie Nell; and even before that it was the property of Uncle Frank, who probably bought it new. A ship’s bell clock, handcrafted in gleaming brass, marking the watches of day and night: a satisfying purchase for a sailor who served in the War to End All Wars. The clock is old now, able to keep time but with its ringing diminished from melodious, well-ordered chiming to random clanging each half-hour. Local craftsmen have not been able to set it right. But then I discover that the Chelsea Clock Company, the original manufacturer, still exists! My clock can be repaired and restored. I had no idea they were so valuable. I fly to Boston, the clock swaddled in my thickest sweater, resting on the bottom of my backpack. I take a Lyft from the monastery to the clock company. Running my finger one more time along the side of Uncle Frank’s clock, I hand it over for cleaning and repair and restoration. That night, in my cell, it occurs to me that I too have come to Boston for cleaning and repair and restoration. Like my clock, I am returning to the One who made me: the only One who has the skill and patience to restore me, the One who sees in me—and in all of us—more worth than we can possibly imagine. The offerings received on Maundy Thursday and at the Good Friday evening service will go to The Good Friday Offering. The history of the Good Friday Offering reaches back to 1922 when, in the aftermath of World War I, The Episcopal Church sought to create new relationships with and among the Christians in the Middle East. From these initial efforts which focused on a combination of relief work and the improvement of ecumenical and Anglican relations, the Good Friday Offering was created. Through the years many Episcopalians have found the Good Friday Offering to be an effective way to express their support for the ministries of the four dioceses of the Province of Jerusalem and the Middle East. Pastoral care, education and health care continue to be primary ministries through which the reconciling spirit of the Christian faith serves all in need. The offering collected at the ecumenical noonday Stations of the Cross service on Good Friday will be split between LINK and THRIVE Peninsula, agencies that provide aid to folks in need in our local community. During the season of Lent, we hope you have been using a “mite box” for your Lenten sacrificial offering. The money collected, when the mite boxes are brought to church Easter Day, will go to Episcopal Relief & Development (ERD). ERD designed the mite boxes, and one of our Lenten resources is a booklet of reflections by ERD staff. ERD is an international agency that reaches out to folks in times of emergency as well as providing training and support for poor people throughout the world. In the mail-out newsletter next week, there will be an “Easter” envelope, which may also be brought to church Easter Day. The offering collected will be used as part of our own church budget. Maundy Thursday: What Does It All Mean? 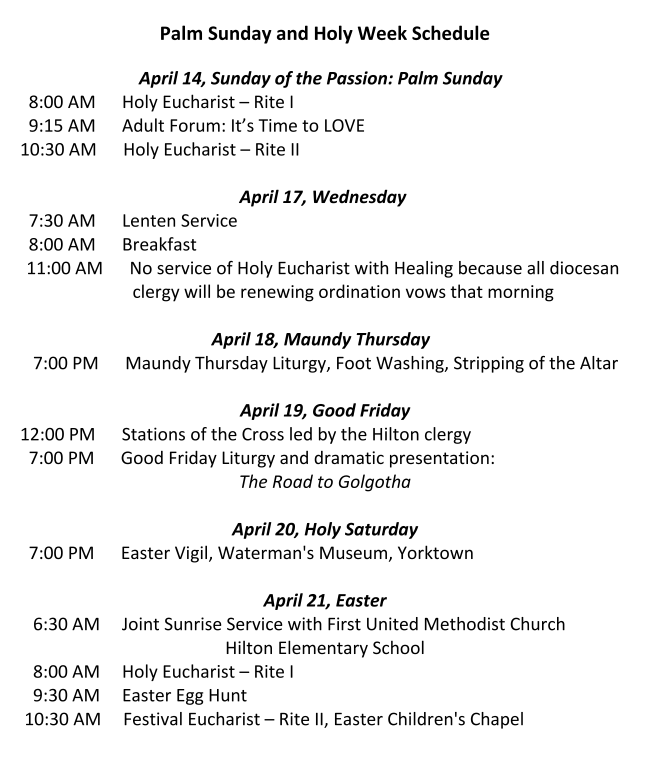 As we prepare to walk through Holy Week together, I thought it might be helpful to share with you some of the rich symbolism embedded in our Maundy Thursday worship. Because we do this liturgy only once per year, it’s easy to lose sight of the many layers of meaning it contains. We celebrate Holy Eucharist in almost every worship service, but this is where it started: on the night before he died, Jesus gathered his disciples together for a meal and “instituted” Communion, identifying the bread as his body and the wine as his blood of the new covenant, and asking the disciples to continue the practice in remembrance of him. In John’s gospel, there is no mention of bread and wine at the Last Supper. 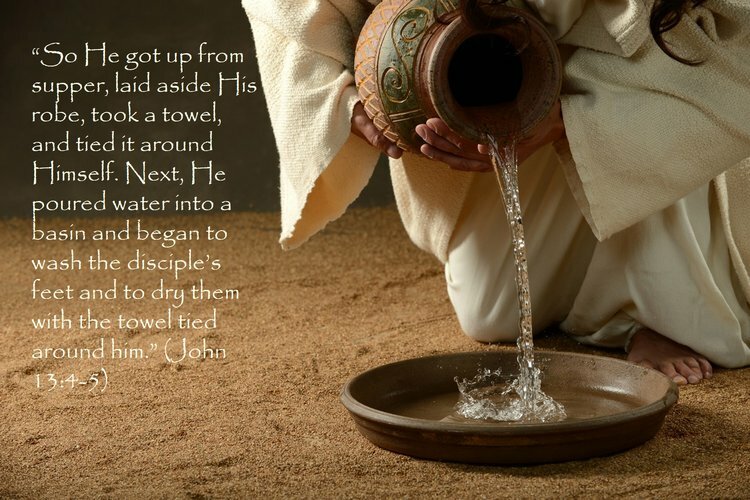 Instead, Jesus washes his disciples’ feet and tells them to serve one another in the same manner. Maundy Thursday draws its name from John’s account—Maundy comes from the Latin Mandatum, which means commandment. Jesus gives his disciples a new commandment: to love one another. This ritual does not appear in the Book of Common Prayer but is practiced in many churches, including St. Andrew’s. It symbolizes what happened to Jesus: being stripped bare and left naked and vulnerable. During the stripping of the altar we remove all of the usual adornments, and we also empty the aumbry, the storage space behind the altar which normally contains consecrated bread and wine. In essence, we remove Jesus from our midst, just as the crucifixion removed him. I wash the stripped altar in remembrance of those who washed Jesus’ body once it was taken down from the cross. The stripping of the altar can be done in silence or can be accompanied by Psalm 22, which this year Sarah Charlock will chant for us. Thank you to everyone who brought candy for the Easter Egg Hunt. We have enough now, so thanks to you all! The Hunt itself is coming up on Easter Sunday, April 21 from 9:30 AM to 10:15 AM. We will be gathering at the church doors on River Road and then the search for the eggs will begin on the lawn on Main Street. Don’t forget to bring your basket! It's never too early to begin baking cookies for Kairos! Recipes may be found here. Package the cookies, one dozen per bag, in quart-size ziplock bags and put them in the large church freezer. Each One, Invite One, Encore! 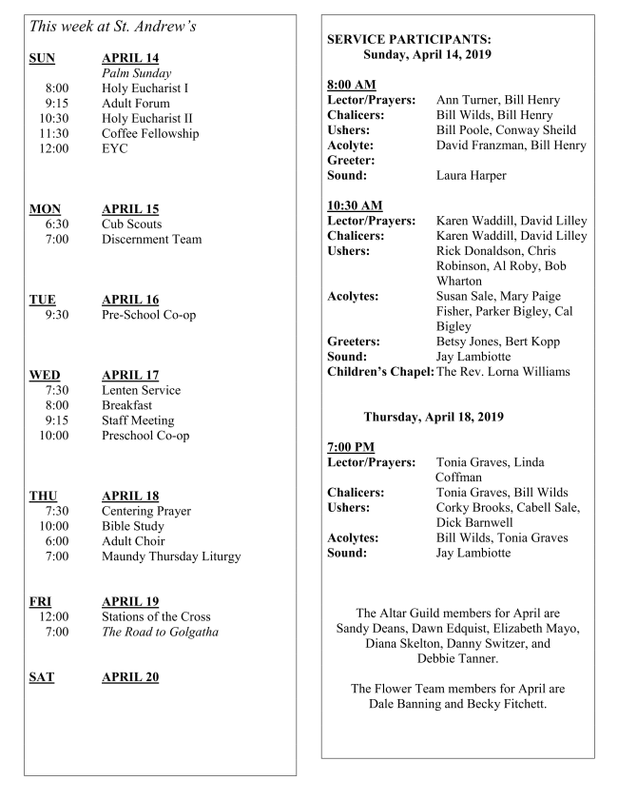 The Congregational Development team is encouraging each member of St. Andrew’s to invite a friend, neighbor, or colleague to visit our church during the month of April. With many new people joining us for worship in the last year, we are a welcoming, committed church family that continues to grow. So for the next month…each one, invite one! St. Andrew's, Newport News, Flower Guild offered a "Flower Arranging for Beginners" class over the weekend. Thank-you to class instructor Allison Clock for sharing your knowledge and giving participants a taste of what the Flower Guild does and the skills to join, if they so desire. Last month, disaster struck worldwide — and ERD needs our help to provide relief and support to communities in need. Cyclone Idai, a destructive Category 4 storm struck Southern Africa in March, flattening homes and causing widespread destruction. Thousands of people are without shelter and food, and hundreds have already died. In early March, a series of tornadoes tore through eastern Alabama. So far, 23 people have died, making it the deadliest tornado in the U.S. since 2013. Disastrous flooding has destroyed property in South Dakota and some residents have been stranded in their homes for more than two weeks. For those who have been impacted by these disasters, this is just the beginning... And with the increasing number of disasters worldwide, there will be more emergencies on the horizon. Please make an emergency donation to Episcopal Relief and Development’s Disaster Relief Fund. There are 2 ways to donate. You may make your check payable to St. Andrew’s with ERD on the memo line and we will combine all our contributions and send one check from the parish. If you choose this option, ERD reports our total contribution to our diocese. You may also donate directly to ERD here. Either way you will receive credit for tax purposes, but more importantly, you will have the assurance that your donation will be wisely used to help those in need. We have a number of forms that we use on a regular basis. 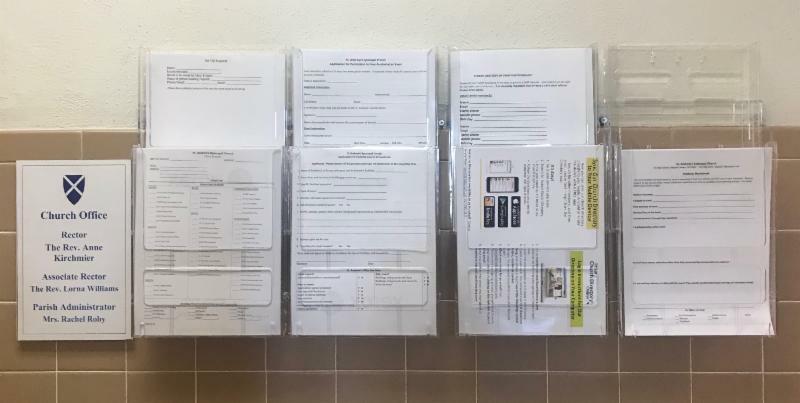 All of these forms can now be found in the rack located on the wall outside of the church office. Please submit completed forms to a staff member or leave on the desk in the church office.. If you need help filling one out just ask! The plans for the 2019 Hilton Area Churches Vacation Bible School are proceeding on faith! Our biggest concern is staffing – we sincerely hope those of you who said maybe can soon say yes ! VBS will be Monday through Thursday, July 15-18 from 9:00 AM to noon. The closing will be at 6:30 PM on Thursday, July 18 at St. Andrew’s Episcopal Church, followed by a simple reception in the Parish Hall. Our VBS supply fee for 2019 is $10 per child. This fee, either check or cash, MUST be paid in advance – no later than Friday, July 12. 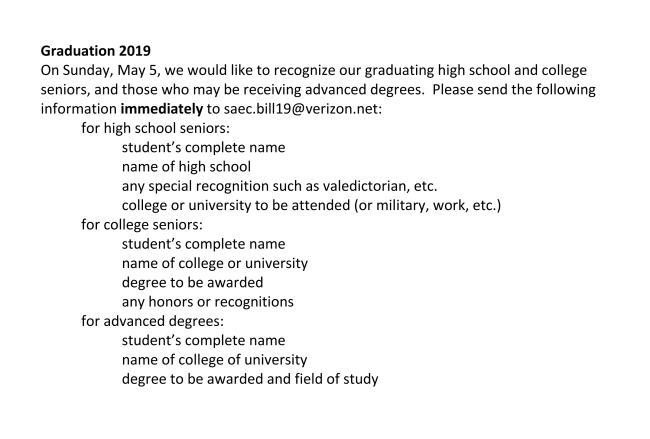 (Scholarship help is available; contact Lorna Williams to learn more.) Checks should be made payable to St. Andrew’s with “VBS” and the child’s/children’s name(s) in the memo section. The supply fee may be dropped off or mailed to St. Andrews: 45 Main Street, Newport News, Virginia 23601. At this time, our plans are still tentative. We are waiting to hear from the City of Newport News as to whether or not summer sewer replacement work will be affecting Main River, River Road, and/or Ferguson Avenue. If this work begins before June 1, 2019, VBS will be moved to Trinity Lutheran. If the actual work begins after July 1, we will cancel VBS for 2019. Special one-time VBS Safe Church training is required for all volunteers 16 years and older, and we will offer that training in a one-day class prior to VBS. Alternately, VBS volunteers can complete the regular Safe Church training online, which is good for three years. If we are certain we have the staff for this year’s VBS and if we know the city’s plans for sewer work, the online registration for the 2019 Vacation Bible School will open on April 30. There will also be paper registration forms available in each church office. We know that some of our Vacation Bible School families have as many as five children which could be a problem when it comes to paying the $10 per child supply fee. If you would like to underwrite some of the expenses for children to be able to attend this year, please make your check payable to St. Andrew’s with VBS Sponsorship in the memo section. Now is the time to register for the Summer Camps at Chanco for young people aged 8 to 16 years of age. Chanco is a residential camp which is part of the Episcopal Diocese of Southern Virginia, a place where children and youth can have fun, make new friends, try new things and enjoy God’s creation. Click here to check out the offerings for this summer. St. Andrew’s parishioners are eligible for the Skip Sherman Scholarship which is available for one person to attend a one- or two-week camping session. Additional money is also available to help with the cost of attending Chanco. Please let the Rev. Lorna Williams know if you would like more information. Camps at Chanco fill up fast, so please register and inquire about scholarship money soon! Do You Have a Guest Room or Apartment? An Episcopalian family in Kentucky is looking for summer housing, a guest room or garage type apartment, for Bryson Clifford, an engineering major who has an internship at NASA Langley this summer. 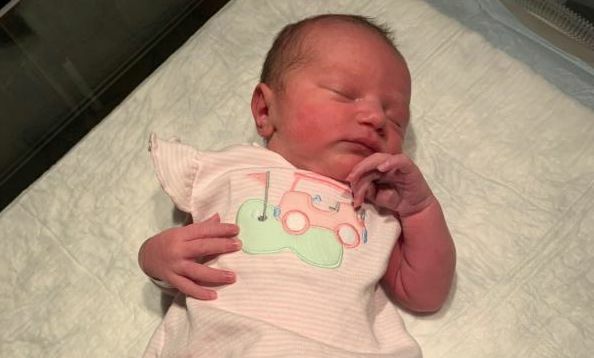 If you can provide such housing, please contact Emmett Clifford, her father, directly at either 859-234-2345 or Fax: 859-658-0846. Cook and cool rice. Drain artichokes, adding juice to mayonnaise. Stir in curry powder. Gently mix rice, onions, pepper, olives, and artichokes. Pour mayonnaise mixture over and stir just to mix. Makes 5 or 6 servings.